Laxmi Vilas Palace at Vadodara is one of the most elegant palaces and in size it is four times the size of Buckingham Palace. Maharaja Sayajirao III commissioned Major Charles Mant to build this magnificent palace and it was completed in 1890 by by R.F. Chisolm. The grounds surrounding the palace has been landscaped by William Goldring. The architecture of the palace has right mix of Indian, Islamic, and European styles. Through the big arched entrance an elephant can easily pass with a howdah on his back. The ornate Darbar Hall with Venetian mosaic floor, Belgium stained glass windows and walls with intricate mosaic decorations has been a venue of music concerts and other cultural events for the Royal family. The colorful interiors of the palace is as impressive as the exterior. 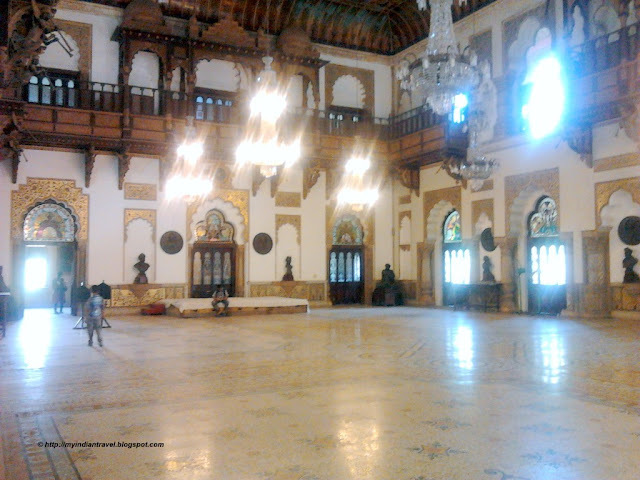 While The floor has multi-colored marble and mosaic tile every nook and corner of the palace showcases various works of art. 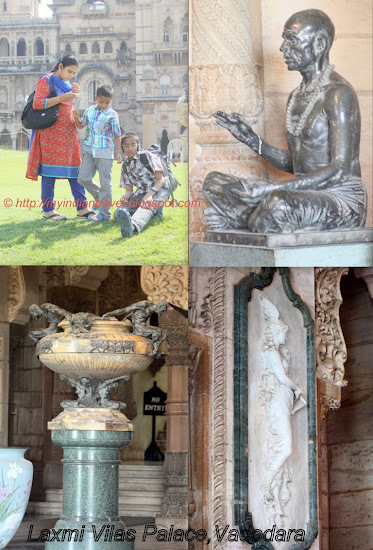 The palace houses a huge collection of sculptures in bronze, marble & terracotta. The palace is open to public from 11 a.m - 5 p.m and and an audio tour is available. It is closed on Mondays. Wow, this is stunning. It is extraordinary in size and beauty! How I would love to see it. You must feel very small and plain next to all this beauty. It would be fun to see an elephant entering in the gate. Your pictures show it off very well. A beautiful palace Rajesh & wonderful architecture. I really like the photo of the interior with the sunlight coming through the windows. Beautiful palace. Visit to Baroda is incomplete without seeing for sure. I love this set, and the interior photo is stunning! A very grand, magnificent palace. Thank you for sharing it. Quite an amazing place....looks like no expense was spared when building it! A magnificent palace and definitely a place I'd want to visit. I'd also like to see the manicured grounds. Now that's what I call a palace. Such a beautiful place -- so many sculptures. A lot of history there! Breathtaking craftmanship in this beautiful palace. It is huge. Wow - that's an extraordinary palace. So huge and beautiful! What a phenomenal place, Rajesh! I have heard the name, "Lakshmi Vilas", in many commercial matters, but I would not have even guessed there would be a palace by that name. Is the 2nd photo from the left, in the top row of the last photo, a classical musician? Beautiful architecture. It looks magnificent !! Good heavens! How spectacular and how absolutely enormous. Thanks for introducing me to it! What a place and wonderful photography of it! Rajesh, I love how much you love India. Thank you for sharing your homeland with us all. My goodness, what a huge and magnificient palace. That underpass is more stylish than most. Beautiful as always Rajesh! The palace looks like a palace in a fairy tale. Simply marvelous architecture and the details are picturesque to shoot!